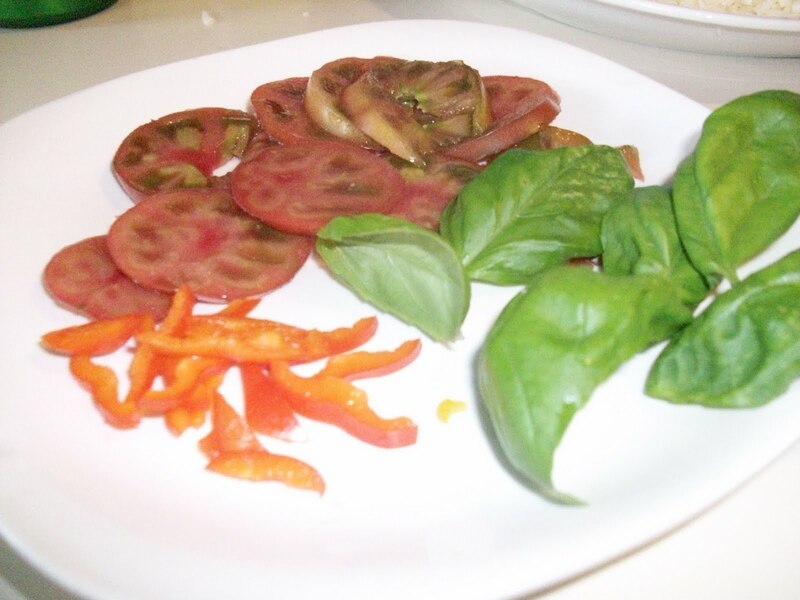 What can you do with Heirloom tomatoes? EVERYTHING!! I eat them with a touch of salt. Add basil and fresh mozzarella for a great salad, as a sandwich, pan seared and served with eggs and hash browns, and so much more. I knew that yesterday was the earliest I could pick them and have them taste fantastic. This year's crop has been stunted. My Eastern facing deck didn't get hot enough in June, nor was there enough early morning sun. So they are about a month late. I've also had a pest problem, so I cannot transplant them anywhere else for fear of spreading insects. Everything must be washed before eating anything from the deck. But the tomatoes are looking really yummy!! So here's what we did with the TWO Black Krim Tomatoes we picked yesterday. Pizza and Fresh Tomato Slices. Pardon the not so perfect pictures. The good camera's battery was dead, so we used the old Kodak, as we were hungry!! 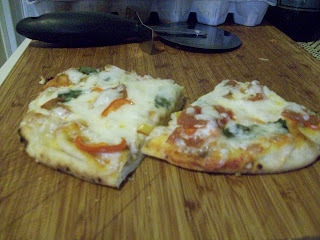 Pizza B was Pepperoni, Salami, Ham, Onion, Red & Yellow Pepper; Tomato Sauce & Mozza. Steps to Great Naan Pizzas!! 1. Gather your Fixins and Pans! 5. Add a layer of Cheese, then toppings of choice. If you have too many tomatoes, just add a light touch of salt and eat them!! 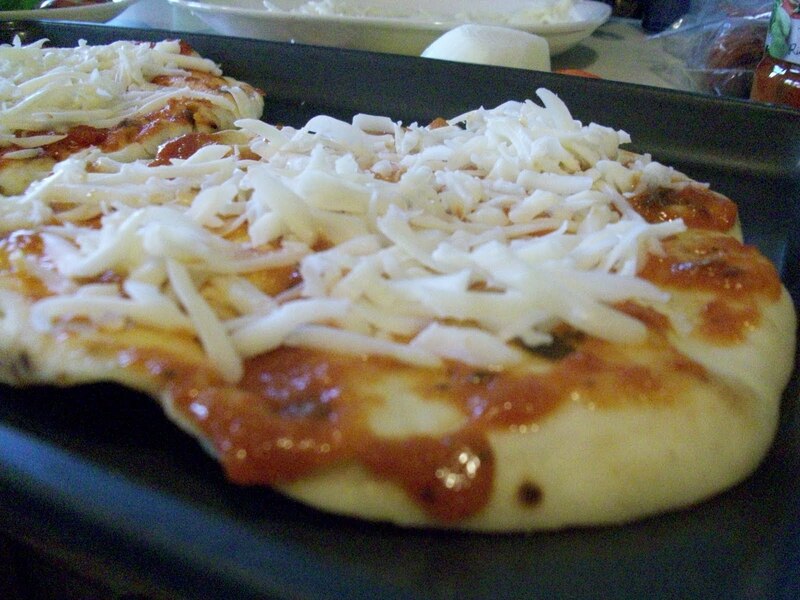 Light Sauce with Olive Oil on Pizza A. Pizza B had more sauce! And more cheese! 6. Add more cheese if desired! Going into the Oven (375 for about 8 minutes). 7. 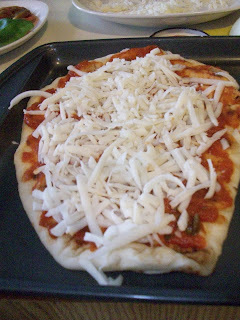 Bake for about 8 minutes, or until cheese is melted! 8. Watch these carefully so they don't burn!! 9. 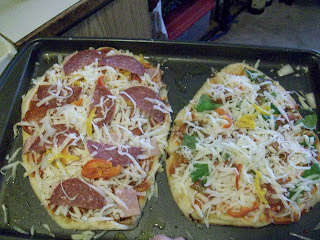 Remove from oven, slice with Pizza cutter and serve! After all was said and done, I realized that I didn't make a huge mess, and these were really easy to throw together. If I wanted to, I could have made several of them and froze what I didn't want to cook. I prefer a thinner, less doughy crust, so for me, these are Perfect!! After Pizza B was done, it was eaten right away, so here is the final result of Pizza A!! Do you have picky kids? I've found that having kids help when you make things will teach them Fantastic Life Lessons (Knives, heat, measurements, food waste, and so much more). So why not prep all the ingredients, and for that birthday party, let them make their own!! I sourced this bread at Top Foods, but Trader Joes has Naan Bread in a 6-pack for under $4.00!! They're a little thinner, but well worth it!! This idea was inspired by Pioneer Women's Steak & Onion Pizza, which reminded me I used to make a Chicken Pizza in years past. Meat and Veggies. The perfect combination! !